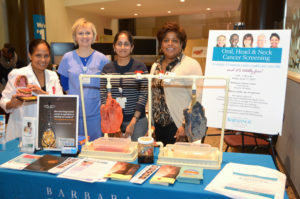 Screening for Head and Neck Cancer as well as educational resources in the KCI clinic. 1. Lecture on OHANC early detection at the Croatian Medical Association on April 4, announcing OHANCAW. 2. Hosting a free screening on Fri April 13 at University of Zagreb Dental School, with media coverage. This year we plan to recruit one major head and neck service hospital in Zahreb in order to co-host screening and. The University of California San Francisco's Head and Neck Surgical Oncology division would like to invite you to a free head and neck cancer screening event. You can expect a review of pertinent risk factors and a screening oral, head, and neck physical exam. 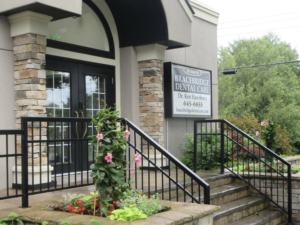 April is Oral Cancer Awareness Month and on April 13th, Bracebridge Dental Care will host a free oral, head and neck cancer screening from 9:00am to 11:30am at 29 Ann Street in Bracebridge. Dr. Ken Hawthorn and his team will collect key medical and social history that target predisposing conditions for oral, head and neck. Date: 4/13/2018 Time: 10am-1pm Location: ENT (Otolaryngology) Clinic, which is located in the atrium at University Hospital, 600 Highland Ave., Madison. Registration: No registration required. For more information: Call Heather Geye at (608) 265-6260. Offered by the Departments of Human Oncology and Surgery-Otolaryngology, these head and neck cancer screenings are free and require no registration.. The William Jennings Dorn VA Medical Center will host a Oral, Head & Neck Cancer Screening Event for Veterans on April 13, 2018, from 10am to 1pm. The screening will be held in the main hospital, 2 East, ENT clinic. Veterans will be seen on a first come basis. Prior to the event we will. Dr. Rob Schleiffarth, Otolaryngologist, will be hosting a free oral, head, and neck cancer screening at West River ENT in Rapid City, SD. The screening will be Friday April 13th, 2018 11:00am-12:00pm and 1:00pm-3:00pm. Screenings are FREE and take only 15 minutes. We are hosting a table in our hospital for staff, patients and any visitors in our institution to learn about screening, signs and symptoms and prevention of head and neck cancer. 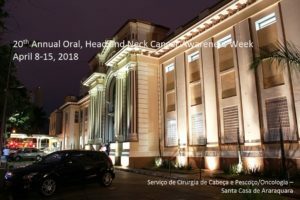 This annual head and neck free screening is open to the public. 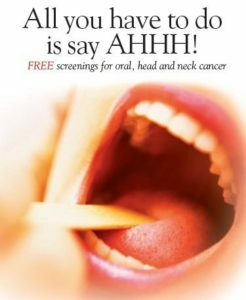 Two otolaryngologist, dental, as well as head and neck radiation oncologist are able to provide free screening to individuals that are interested in being checked. 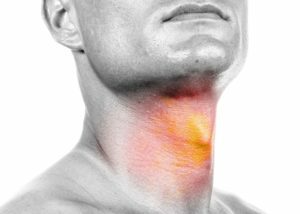 Information will also be provided to the public about signs and symptoms of head and neck cancer, risk. 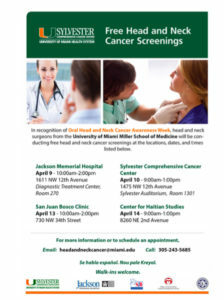 UAB Otolaryngologists will provide FREE oral, head and neck cancer screenings to support Oral, Head and Neck Cancer Awareness Week (OHNCAW). If you think you may be at risk, or are concerned about a loved one, we encourage you to attend. No appointments are required! UTHealth Otorhinolaryngology Oral, Head, and Neck Cancer Free Screening Clinic Friday, April 13, 2018 1 PM - 4 PM 6400 Fannin Street, Suite 2700 Houston, TX 77030 The UTHealth Department of Otorhinolaryngology – Head & Neck Surgery will offer free cancer screenings in observance of the annual Oral, Head, and Neck Cancer Awareness Week (OHANCAW).